I am Colin Berrido, I was born at an early age to a very nice lady…………..
Having studied the piano for seven years, at 14 I realised this was not the instrument for me. Well it was 1966, and Merseyside, so the obvious switch was to the guitar. I cashed in my Post Office savings and bought an acoustic guitar, a copy of Bert Weedon’s “Play in a Day” and a chord dictionary. As it was the summer holidays I practiced what seemed like day and night. I didn’t get on that well with “Play in a Day” but the chord dictionary made some sense and coupled with the musical knowledge gained from playing piano I managed to learn Bob Dylan’s “Love Minus Zero – No Limit” in about two weeks. The singing wasn’t so hot (but sounded just like the original!) but I got the chord changes in time. Flushed with success I managed to find an old Vox electric guitar that wasn’t working in a local junk shop and bought it on the cheap. With help from my neighbour Charlie, who was a TV repair man, we soon had it working again and after having rewired my tape recorder to act as an amplifier I was ready to rock! By now I knew a couple of dozen open position chords and some barré chords plus a few blues riffs, so the world of playing in a band beckoned. Over the next few years I played in various small bands with my friends, nothing too serious as we all had our “A” Levels to study for, everything from blues, rock and folk – an eclectic time indeed. When I was 19 I was asked to join a local barn dance band. Barn dance band? Well, they paid me, gave me beer and fed me – it would have been very rude to say no. So started a lifelong love affair with Celtic music. In parallel I was also in two other folk bands playing guitar, bass, mandolin and banjo plus helping to run a local folk club. In addition I gained a good reputation as a “last minute dep” helping out local covers bands. I finally formed an electric barn dance barn with some buddies called ‘The John Bull Band’. We were in much demand locally and that only stopped when my “day job” in the corporate world as an industrial chemist took me south. It wasn’t long before I had formed another dance band – ‘Rogues Gallery’, which is still going strong (check out the music links) and kept on playing dep guitar in covers bands and other dance bands. 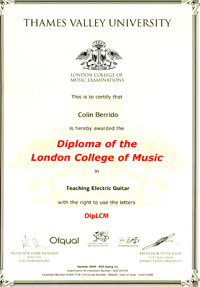 On leaving corporate life I set up my teaching practice, studied hard and passed my Teaching Diploma from the London College of Music with the help and support of the Registry of Guitar Tutors. 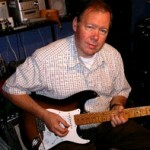 Over the years I have helped out doing sessions on numerous recordings playing rock, country, folk and even filmed an instructional DVD on how to play Electric Folk – almost famous!